Tonga is a land of unspoilt wild beauty, where pristine coral reefs fringe perfect desert islands lapped by more shades of blue than we knew existed. This is the postcard desert island of dreams. We love it here. As a country, Tonga has resisted the cruise ships and large scale resorts and opted to keep its soul intact. Tonga is unpolished, gritty and unfailingly authentic where pigs and chickens have right of way and life ticks along at its own informal pace. This is its true charm. As a remote Pacific nation, Tonga only has one native mammal, the flying fox, a one metre wingspan fruit bat which takes to the sky in impressive numbers at sunset each night. Having no mammals also means that the plants have never found themselves under attack and so have not evolved spines. However, the real star of the show that puts Tonga on the map is the humpback whale migration from July to October. At this time of year staggering numbers swim up from Antarctica to calve and rear their young. Tonga is one of the few places in the world you can safely swim face to face with a humpback whale in crystal clear tropical water, making this a double bucket list tick trip for many. Tonga’s coral reefs boast excellent coverage and impressive marine biodiversity. There is a broad array of reef fish on offer and sometimes we will catch Bluefin Trevally straight off the beach. However. our favourite character is the docile Leopard sharks often spotted silhouetted on white sandy channels nestled between towers of coral. Oh and don’t forget the prehistoric coconut crabs, spanning a meter wide. These are largest land arthropod on Planet Earth. Before and after your island adventure we base ourselves at Kitesurf Tonga, a remote island lodging consisting of simple yet charming fales peppered along a pristine beachfront, a perfect stepping stone before you are castaway. If you have ever wanted to try your hand at kite surfing, this is the ideal place to tag on a few extra nights and give it a go. We return back here for a beach bonfire and hog roast celebration. 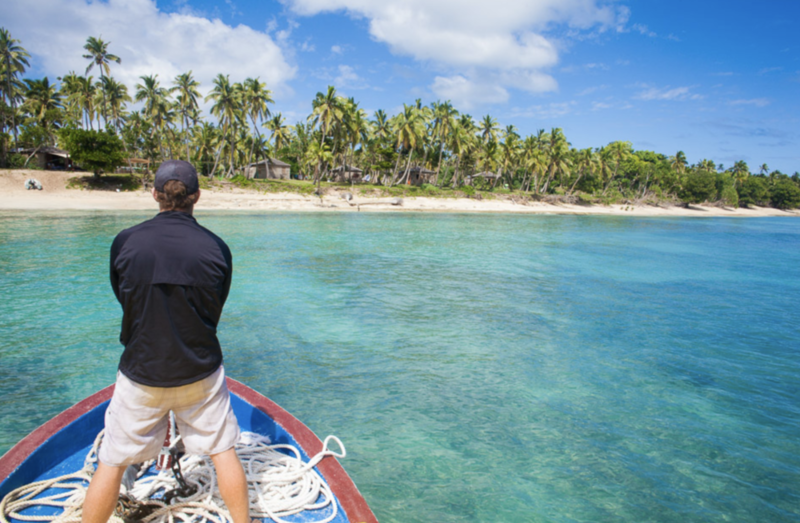 Tonga has a tropical maritime climate that can be split into two distinct seasons. April to November is cooler and less rainy, whereas December to April is warmer and wetter, punctuated by the occasional tropical cyclone. Needless to say, we prefer the former. During the drier season, humidity is less and the temperatures are very comfortable with daily highs of 28C and lows of 20C. The sea is also a little more refreshing clocking in at 25-27C. Taking this into account as well as the Humpback whales, we run our expeditions to Tonga from April until December. Hold the phone, where even is Tonga? Zoom out on the map below to get a sense of where Tonga sits. If you want to see the most unspoilt natural beauty on the planet then you have to work a bit to get it. Tonga is served by Fuaʻamotu International Airport (TBU). There are direct flights from Sydney, Auckland and Nadi (Fiji). Tonga is serious about Sunday as a day of rest, in-fact their airport is even closed. Flights to and from Auckland are daily (other than Sundays) Nadi is serviced on Mondays and Saturdays and Sydney is Tuesdays and Thursdays. We do our best to take this into account when selecting our trip dates, however, it is possible you might have to add an extra day or two to your trip and see a little more of Tonga.